Daily Dog Scoop: Family Dogs: Something to be thankful for this holiday season! Family Dogs: Something to be thankful for this holiday season! The holiday season can be a lot of fun, but it seems to cause a lot of stress for humans too. This is when the important work of dogs comes in. Sure, I do my part to help my person relax every day, but this work takes a little extra care during the hectic holiday season. You may be stressed about who is able to make it this year. You may worry if someone forgot the cranberry sauce or if the mac 'n cheese is not cheesy enough. All the while, you can count on your dog to remind you that there is a whole turkey in the oven. Whole. Freakin. Turkey. There are lots of other things dogs can do to help remind you of the joys of the holiday season. Instead of just raking the leaves, spend a little time playing in them too. Curl up with a loved one by the fireplace. Sleep in. Eat leftovers for breakfast. Give lots of hugs. Chase deer (ok, maybe you won't like the last one). My person is a little stressed about sitting in traffic on I-95 all day today, but I keep reminding her that on the other side of that trip, we will get to spend some quality time playing with my cousin Lily (and the rest of the human family of course). We are pictured above posing as two warm croissants snoozing in front of the fireplace last holiday season. 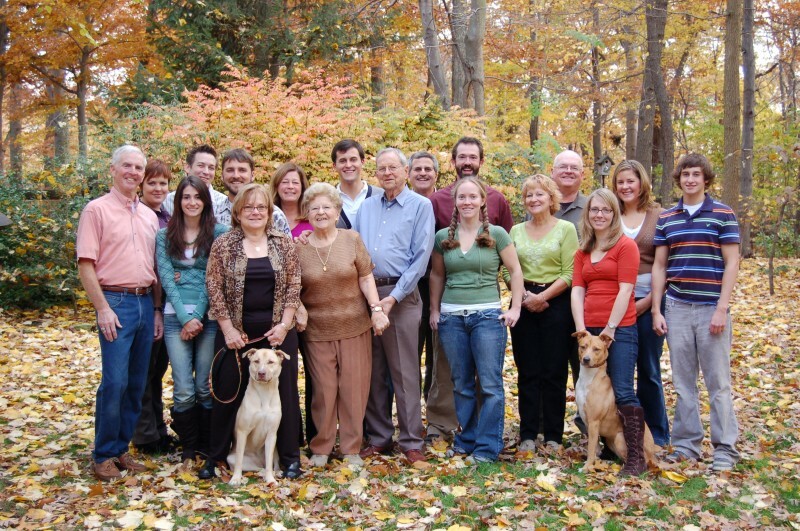 We are pictured below with the great family that we are lucky to be a part of. How could you be stressed out about something like that? Your dog, who perhaps once knew life on the street or in a shelter like me, will be quick to remind people that most of us will be spending the holiday, and every day, in a place of abundance, peace, and love. Now, that is something to be thankful for. What a wonderful post. And that family picture is fantastic! Happy Thanksgiving! a great reminder of what is truly important! With so much to be thankful for, let's remember the orphaned pets spending the holidays in shelters. Don't buy. Adopt. And spread the thankfulness by supporting your local shelter through donations of $$, goods, or time. Every pet deserves a home.